Matrox Powers 8 Displays With A Single Card | OhGizmo! How many monitors do you have sitting on your desk? For most people the answer is one, sometimes two. This is understandable, considering most computers only support 1-2 displays. Video card manufacturers are starting to discover that some people need more than a couple monitors, and thus are crafting cards that cater to them. ATI recently launched their Radeon 5800 series, which allowed for 6 displays, but now Matrox has one-upped them with their new M9188 card. 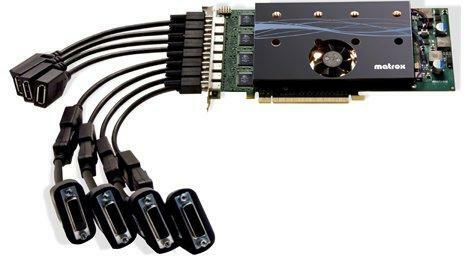 If you have an octet of monitors and are tired of dealing with multiple video cards, then this new card from Matrox is exactly what you need. If you have dreams of stretching your favorite games across a wall of monitors, sadly this is not the card for you. The M9188 was designed with enterprise clients in mind. The Radeon 5800 cards are going to be a better bet, especially with the new Eyefinity technology. Of course the $2,000 price tag will surely be enough to drive off all but the most eager of buyers. Now I can run those 7 extra displays I have. That is sweet. Currently I do not have a need for it, but I would make a reason/need. Last time i used a set of more than 2 monitors at once, was when i worked in army. It was hooked to a security cameras. At home, unless you happen to be really fanatic about keeping an eye to several live feeds at once at full screen…. well, you could use several wallpapers at once. Or use simultaneously up to 8 terminals.